Once upon a time, long before the hype pervaded popular culture, the major sneaker brands would typically deliver one, maybe two coveted releases a month, with a heavy emphasis on storytelling. Nowadays, it’s commonplace to see these different labels ditch the ‘who, what, where, when and how,’ and instead drop multiple pairs of heat in just one weekend. A welcomed dilemma for most. With that said, we continue our weekly roundup of the most sought after silhouettes for the week, hoping to make your ‘cop or drop’ decision as easy as possible. Check out the list below and chime in on the styles you’ll be picking up. Nike continues its Black History Month celebration with a special iteration of the Air Vapormax model. Here, the Flyknit upper features a grey-to-black gradient as you move from its ankle entry down towards its Vapormax sole unit. Red and green complementary colors have been added to the heel and toe, respectively, while the date “08-20-1993” is stamped on its heel in gold, paying homage to the olympian Colin Jackson. The Air Jordan 1 Flyknit also joins Nike’s “BHM” collection, hosting the same black, red and green color-blocking. Black makes up the majority of this lightweight upper, while red and green find their way onto the toe and heel areas, respectively, with the same pattern present on its outsole. “November 22, 2016” is printed on the insole to commemorate the day in which Michael Jordan received the Presidential Medal of Freedom from President Barack Obama. Converse follows up the heat from Tyler, the Creator’s GOLF le FLEUR* collaboration with a new selection of One Star models. The drop honors the silhouette’s original debut during the 90s as its predecessor was designed for the basketball court. The sneaker would then regain popularity as it was adopted by skate and streetwear culture. As a result Converse has cooked up a selection of iterations hosting a variety of patterns and materials such as premium suede, camo, pinstripe and more. Following the Light Bone/Summit White colorway, Nike SB’s Dunk Low Pro “Decon” is back in a contrasting edition. This time around, Black and Anthracite are the hues of choice, while the sole unit is treated in white. Premium leather dominates the upper and lining, with Nike’s SB branding on the tongue and heel. The Three Stripes welcomes another member to its NMD family. Dubbed the adidas NMD_Racer, this model adds a new pattern to its Primeknit upper with the NMD’s signature EVA midsole inserts still present. The forthcoming drop is done in “Solar Pink” with contrasting black coloring on the heel and outsole. This year marks five years strong for adidas’ BOOST technology. 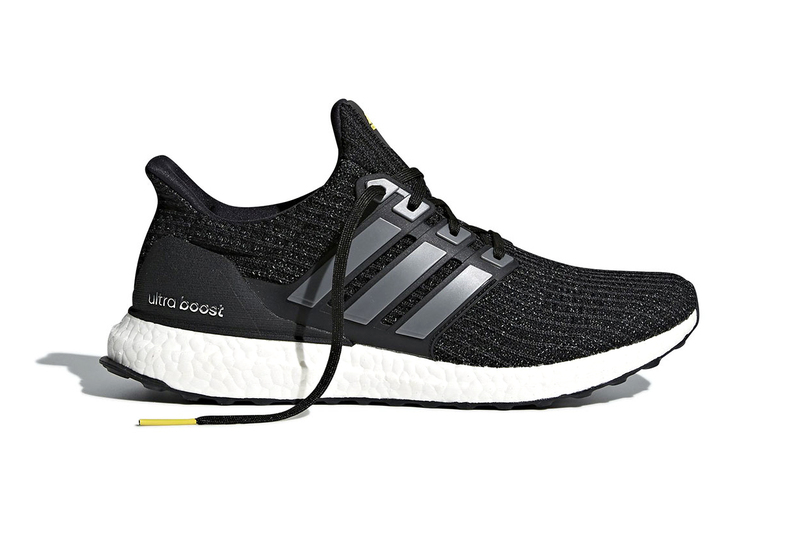 Making its debut with the EnergyBOOST back in 2013, the Three Stripes will celebrate this milestone with a limited-edition drop of its fan-favorite UltraBOOST model. Keeping things simple, the Primeknit upper is coated in black with grey detailing on its lacing cage and hallmark white BOOST midsole. Nike’s Air Max 93 OG is only one of the many releases leading up to this year’s Air Max Day. Set to drop in its signature “Sport Turquoise” colorway, this sneaker is dominated in white coloring with black accents above the midsole and on its neoprene ankle entry. The main attraction however, is the turquoise hue that appears within its Air unit and on its Swooshes. Also joining this year’s Air Max Day lead-up is the Nike Air Max 180. Returning in its recognizable “Ultramarine” colorway, Nike’s Air Max 180 was the first sneaker to house 180 degrees of visible Air cushioning. White, solar red and blue join the mix to complement the Ultramarine theme. Jordan Brand aims to celebrate Chinese New Year with a special version of its Air Jordan 6 sneaker. Previously released in Asia, the celebratory pair will now hit Stateside retailers, boasting floral and fireworks embroideries. Gold detailing is also found on its midsole, heel tabs and lace-locks to round out this festive drop. The three-day festival takes place in Barcelona from May 30 through June 2. We spoke to five producers to gain insight. Doubling the bottle’s estimated sale price.